On Hot Days, car starts, can not go into drive/rev, no dash display, no radio. After cooling off at night will work fine. Today wife driving home, dash, radio and A/C all shutdown, car still drivable, but can not move shifter (auto-trans) from Drive, to park or neutral. When the problem is occurring measure the voltage on fuse 32 in the underdash fuse panel. Don't remove the fuse to check power on it. Let us know what you find out. OK will try, wife is the driver so hard for me to see issue. The Acura Dealer replaced radio about 1 year ago, beacuse it was going on/off loosing memory? Do you think some wire is disturbed? 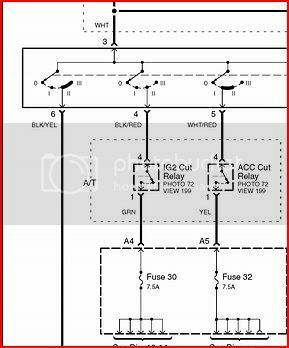 What is thinking on fuse (#32, 7.5A) for accessory power/audio???? Do you think some wire is disturbed? What is thinking on fuse (#32, 7.5A) for accessory power/audio???? Those items you mentioned have something in common and that is they share the same power circuit that fuse #32 protects. Unless you have a volt meter and measure the voltage at the fuse when the problem is occurring, you won't have any direction. Yes your correct. Parked the car in the sun today 98 degrees here in Sacramento. Started the car, no radio or AC, would not go into gear. Jumped on the floor board with my voltmeter in hand and the voltage on the fuse is 0v. After 15 seconds or so the radio came on and trouble disappeared. Wife has had issue at start up mainly, but has gone out while driving also... on/off/on/off but drivable. Now where does that trouble lie? Some Relay? Power comes from the ignition switch and goes through a relay called the ACC relay. From the relay power goes to the fuse. You'll need to check to see if power is coming into the relay and leaving the relay. With the relay plugged in and your meter back probing the relay connector, measure the voltage on both the white/red and yellow wires when the problem is occurring. This will tell you if the ignition switch is good, the wiring from the switch is good, and if the relay is able to pass along current. Measured in the morning both points 12v when system was working, baked the car again in Sacramento heat.... 98 degrees and started car at 5PM, problem reoccured. Probed both leads =0v when problem is happening. If you don't have 12 volts on the white/red wire, it is starting to look like an ignition switch problem. 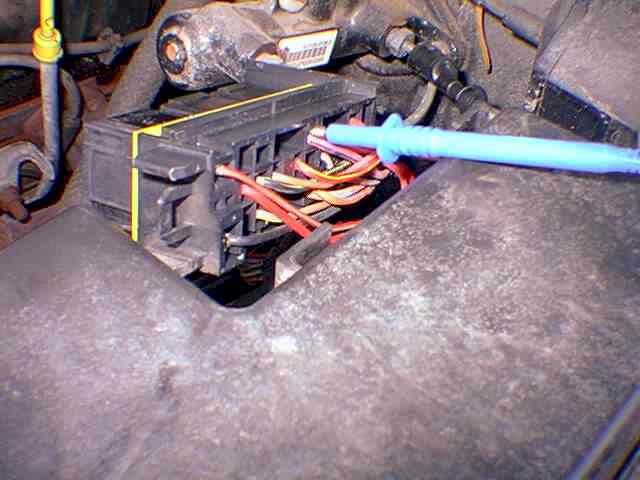 You would have to go to the ignition switch connector and back probe the white/red wire just to confirm you don't have a wiring problem before condemning the ignition switch. Wanted to tell you I have not given up... weather here has been milder and just not able to get issue to happen below mid 90's. I've tried a blow dryer on some of the areas as well in hopes I could get something to fail. Looks like Wed 95, Thurs 97, So I will bake the car again in hopes issue occurs. I have a volt meter on back probe of the steering.... but problem is illusive. Got to 95 today, had a very brief outage of systems (Radio, AC and Dash). Voltage appeared to drop on red/white. I was unable to repeat, heard a click as i adjusted to probe thinking voltage had gone and maybe connection was not made on back probe. Try again on Thursday... expect 98! OK got to 98 degrees today, the problem did reoccur. I used a can of contact cleaner (cools the area) and sprayed the ignition and the (Relay?).... the problem went away. Seems like the thermal issue is the Key (ignition/cylinder) or the relay that I'm back probing the red/white wire on. Quick re-read so sorry if something missed. Just of note that relays to supply power usually are using a magnetic coil and points inside sprung to be "open" and when empowered touch to make the connection. Two funky things can and do happen with temperature with these that isn't common but does happen. The trigger for magnetic part has to have adequate power and contacts even if they touch don't always allow any or enough current thru. The higher the temp the less a magnet works and who knows alignment of points being effected also. Don't try it but a magnet will not pick up glowing hot steel! You are finding this either working or not at all and that's enough for me to toss the relay involved as you could test forever and not conclude much for sure. You already seem sure that it has a temperature and problem related to that so I say toss that relay unless so expensive or you can't open it and clean points which I totally doubt was made for that long before 2008. For amusement if you do toss it take old one apart and see what's going on inside but it will no doubt wreck it for use again. Don't think it is a relay causing this because the OP stated they were missing power on the white/red wire that comes from the ignition switch. If the problem occurred and you had no power at the ignition switch on the white/red wire, more than likely the ignition switch is the culprit. Looks like we are almost there. The probing of the back wire is confirmed, 0v when problem is occurring. Should I order new ignition switch? I think just the back section of it not the entire unit? If just the pack part it is only $40, but whole ignition switch is ~$300? If you have 0 volts on the white/red wire and you have battery voltage on the white wire back probing the ignition switch connector when the problem is occurring and when the ignition switch is in the I and/or II position, you either have a bad ignition switch or some type of poor connection in the ignition switch connector. If the terminals in the ignition switch connector look good and are properly tensioned, you have pretty much isolated the switch. I wanted to let you all know I replaced the switch, it was not that difficult, and so far all seems well. Unfortunately the hot summer days had ended, so I will have to wait to see how summer 2015 goes, since fall does not happen till 95 degrees. I want to thank everyone for the help in troubleshooting! Well - cross fingers that you've nailed it as duplicating the real ambient temp all around a vehicle is VERY difficult and IMO not quite the same as this time of year I lack the sunlight (MA) but just heat the heck out of a whole shop that takes forever to impossible up to that range of temperature. Did it once and that was enough with every freaking construction heater I could muster just to verify another shop's repair to a broken climate controlled A/C fix that it worked as person was headed right away to warmer area of US and really wanted to know? Never heard back and probably wouldn't but it did work but what a pest to do that.